On September 21, 1936, five Sisters of Charity of the Blessed Virgin Mary began teaching at St. Francis Xavier School. Eldene Bruneau, a member of the St. Francis Xavier Parish, had graduated from Clarke College in Dubuque, Iowa, where the nuns were headquartered. She wrote to them, asking if nuns could be sent to teach in Phoenix. She was told if 100 children enrolled the sisters would come. Dedicated parishioners campaigned in the Parish and within a very short time succeeded to fulfill the requirements of the sisters. In the Spring of 1936 Fr. Robert Burns, S.J. the fourth Pastor of St. Francis Parish announced that a contract had been signed with the Sisters of Charity of the Blessed Virgin Mary from Dubuque, Iowa to provide 5 sisters to inaugurate an eight grade parochial school. On September 21st 1936 St. Francis Xavier School opened in Regis Hall in the present Brophy College Preparatory. The parochial school soon became the center of parish life. In September 1937 the school registered 237 students. There were eight teaching nuns with one more added during the school year. On April 4, 1937, 26 children celebrated their First Communion. A special collection for the school was started and taken up each Sunday at Mass. A large number of people pledged the sum of $1.00 a Sunday for the school fund. By 1943 the St. Francis Xavier School had an enrollment of 400 students and added a preschool and kindergarten. With the enrollment expanding each year, it became obvious that the school had outgrown their space at Brophy. 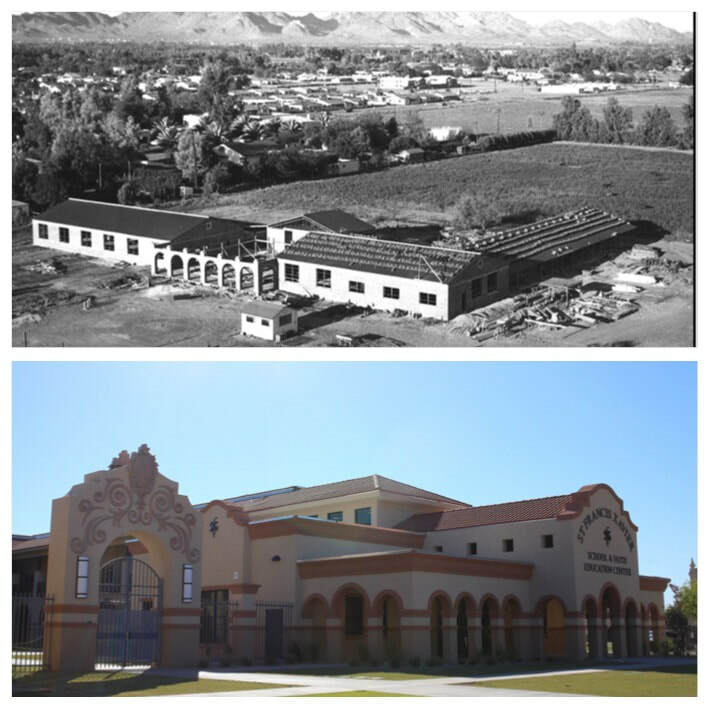 In 1947 the parish began to build a new school building which included kindergarten, 1st and 2nd grade classrooms, and administrative space. The new building was all ready for the 1948 school year. In 1951, seven more classrooms were added to the existing school structures and were completed by 1954, with the exception of the cafeteria which was added in 1960. St. Francis Xavier School as we view it today, is different from our beginnings in 1936. Over 75 years later, St. Francis Xavier is still supported by a thriving parish and community of dedicated families – many who have been at St. Francis Xavier for generations. Mission Statement: St. Francis Xavier School, a faith community grounded on Jesuit principles of superior education, cultivates excellence in mind, body, and spirit sending forth Kids for Others.